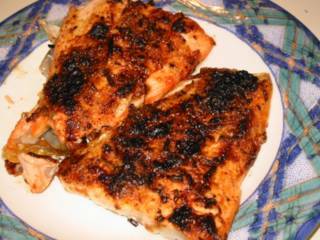 Yesterday we had one my favourite fish dishes - grilled salmon. Marissa, my old elementary school friend, who now resides in Vancouver is credited with introducing me to this very simple yet very yummy recipe. It's up to you to put whatever topping you want here. Last night we used the French onion soup mix (dry) and made them real crispy (almost burned which I like). This of course won't be complete without the accompanying lemon and toyo (soy sauce) dip. Oil the grill pan a little. Put salmon skin side down on the pan. Spread mayonnaise on the salmon fillets making sure they are evenly coated. Sprinkle spice toppings on top. Grill on medium heat for about 10-15 minutes or until salmon is cooked. Serve with mixed lemon juice and soy sauce as dip. wow, another food blog!!! welcome to the blogging world! Your Salmonise looks yummy! I once tried Baked Salmon at a party while in LA, and it was really good. I noticed that, as you've said , there can be a variety of toppings for Baked/Grilled Salmon (once, I even saw slivered almonds as topping!). I think I will try your version, next time. The last time I made this dish, I used mayo with minced garlic and spring onion. It was a hit with my husband and kids! Thanks for dropping by. And yeah grilled salmon is one of my favs. I also visit your food blog regularly. I noticed you do stir frys - I love stir frys especially with just one type of veggie like what you did on that spinach, tama ba? Plus they're very healthy. I've changed the name of my blog again - I keep changing my mind ! 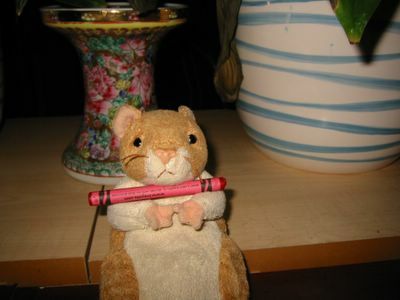 hi celia, thanks for visiting my blog too! Yeah, most of the time I just stirfry anything I can get my hands on, hahaha. I find it very easy plus mabilis pa! That was camote leaves by the way, not spinach, fresh from my mother-in-law's garden! Hope to see more recipes on your blog! I don't mind the name change, but do keep on posting!